Hi everyone! 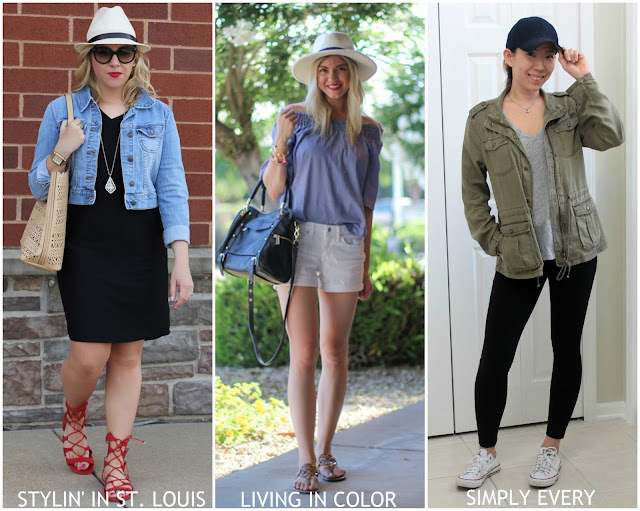 Today I am sharing a super comfy look! This dress is t-shirt material and was under $20! I might have to go back to Target for more colors! 1. 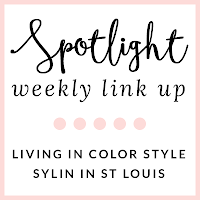 We kindly ask that you follow the two hosts: Elle from Living in Color Style, Jacqueline from Stylin' In St. Louis, and our co-host JeeYoung of Simply Every via Bloglovin or GFC. Spotlight: Our spotlight of the week is Kim of The Knotted Chain! We fell in love with Kim's gorgeous white dress! It is the perfect little white dress! Her accessories are perfect with this look! Be sure to check out her blog! Jacqueline- thank you so much for featuring my look this week :) I love your style and how you paired your hat with a dress and denim jacket, but what really makes this look unique and extra stylish is the pop of red- def need to get myself a pair of those sandals! Those sandals are fabulous! Perfect with the dress. Nothing is easier and more comfortable than a tee shirt dress! You look super cute in this hat & love the LBD with the red lace-up sandals! this is such a perfect spring outfit, your sandals are so cute. You're so precious!!! LOVE those sandals and you look like a model!! Love those sandals and your dress looks so chic and comfy! Oh, those red sandals! SO pretty! Love the hat with this outfit, too! This is a cute and causal outfit! I love your hat and shoes. Love your red lace ups!! Come on over and link up your look on The SHOE AND TELL Fashion Link Up, NOT just for shoes, on STYLE NUDGE. Thank you for hosting! Too cute! Love the pop of red with the shoes! I just ordered some new hats I am really excited about for summer. Love yours with those great shoes! I love this look!! loving the hat, and your red lace-ups are adorable!! You look so cute! I love your hat! I adore everything about this outfit, especially those lace ups! What a cute and classic look! There is nothing like a t-shirt dress and denim jacket for summer. Love the lace-up red sandals, too! You always look extra adorable in hats!! Love those lace up sandals with this look! So so good! Loving your classic summer hat, lady! I LOVE your red strappy sandals! They would go perfectly with the outfit I wore today! I must look into buying them! Beautiful style paring the lbd with jean jacket and red lace up sandals! Those red gladiator flats are EPIC. I adore this look, the lace up flats are so amazing! those red sandals are awesome! great look! this look is so pretty! totally lovin' the vibe! This is a great place organize an event; they have great staff and great events put on here! I had nothing but great times and great conversations at event space Chicago here. They served slider and shrimp cakes as appetizers with chicken skewers, and eggrolls that had veggies on the inside and some kind of creamy fruit sauce on top.